The process of human gestation graphically illustrates that "life, which is love and the will therefrom, strives unceasingly towards the human form" (DLW 400), for the embryo actually achieves the human form, becoming a fit receptacle for the human spirit. It is known that the soul of man commences in the ovum of the mother, and is afterwards perfected in her womb, and is there encompassed by a tender body.... The case is the same when man is born again, that is, when he is being regenerated. The new soul which he then receives is the end of good, which commences in the rational, at first in an ovum there, and afterwards is there perfected as in a womb; the tender body with which this soul is encompassed is the natural and the good therein; ... the truths therein are like the fibers of the body, for truths are formed from good. Hence ... an image of the reformation of man is presented in his formation in the womb. And so when we look at the rapid changes which the embryo undergoes in the womb-dividing into eagerly proliferating cells, sending out roots to anchor itself to the uterine lining, and drawing in nourishment; differentiating into structures which coalesce out of unformed masses, then bud, pinch off, branch out, bend, twist, form pouches, migrate, detour around each other, meet, fuse, form partitions and break them down, grow, become firm, and begin to assume their functions-we can gain a vision of the wonderful ever-increasing complexity and consequent unity of the human mind. In this paper, which deals with the embryonic period, spanning the third to eighth weeks of prenatal life, I will point out some possible correspondences in the three germ layers of the embryo and the development of the heart, lungs, and brain. I have yet to discuss the stages before the third and after the eighth week; I chose to begin with the embryonic period because of its inherent drama. That every created thing is of a double and triple character is evident from the parts of the human body, in which every nerve consists of fibers, and every fiber of fibrils; every muscle is composed of bundles of fibers, and these again of motor fibers; and every artery is formed of coats in a triple series. It is the same in the human mind, whose spiritual organization is of a similar nature; that is ... the human mind is divided into three regions, the highest, which is also the inmost, being called the celestial, the middle the spiritual, and the lowest the natural. and finally the mesoderm insinuates itself between them (Fig. 3). 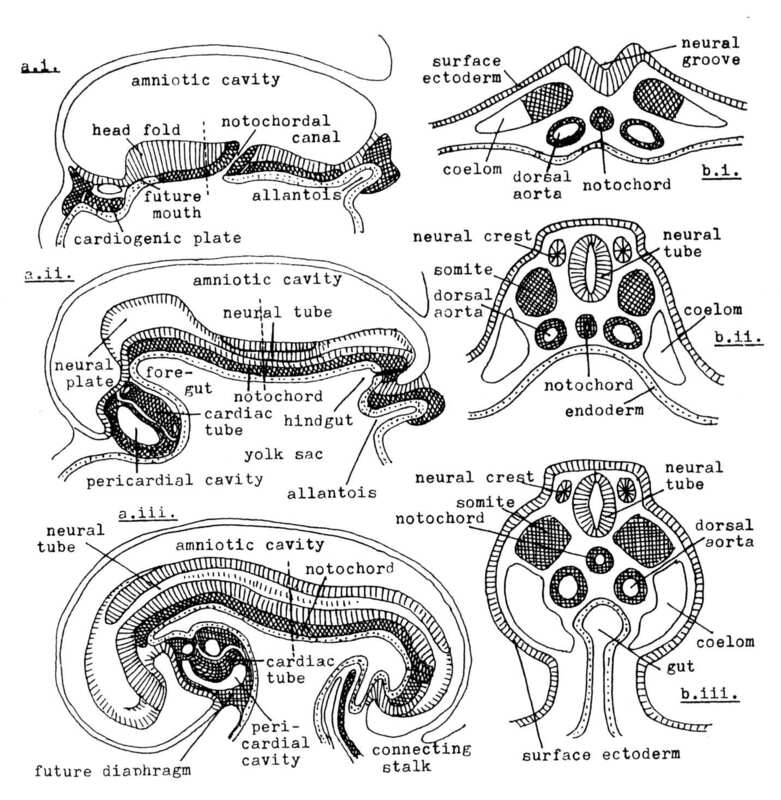 Perhaps this is a good place to mention that the whys and hows of embryology-what comes from what, what turns into what, and what causes what-are still controversial and incompletely understood, even though descriptive embryology is well established. The three germ layers of the embryo are not hard-and-fast structures with sharp boundaries, but rather are distinguished according to their eventual destinies, which are not yet irrevocably fixed. Each cell's range of career choices gradually narrows until its descendants take their final places in the scheme of things. The brain, like heaven, is in the sphere of ends which are uses; for whatever flows in from the Lord is an end looking to the salvation of the human race. This end is that which reigns in heaven, and thereby reigns likewise in the brain; for the brain, which is where the mind is, looks to ends in the body, in order that the body may subserve the soul, so that the soul may be happy to eternity (AC 4054). ... All things of man have their existence from the life of the will, which is love, from their first principles, out of the brains, through the fibers; and all things of the body out of the heart through the arteries and veins. The order in which the germ layers arise, first endoderm, then ectoderm, and finally mesoderm, illustrates that in regeneration truth is first acknowledged, then put to use, and finally love is implanted by the Lord. The other organs and systems arising from the germ layers confirm the view that mesoderm corresponds to love, encloderm to wisdom, and ectoderm to use. Not only do the brain and nervous system arise from the ectoderm, but so does the skin (Fig. 4b). just as the brain is the boundary and communication between the spirit and body, mediating "a descent from the heavens into the world, and an ascent from the world into the heavens" (AC 4042), so the skin is the boundary between the body and the outside world, preserving the body's integrity. "That the skin is the ultimate that holds the interior things in connection is plain, for when the skin is taken away the interior things flow asunder" (AC 10,044). 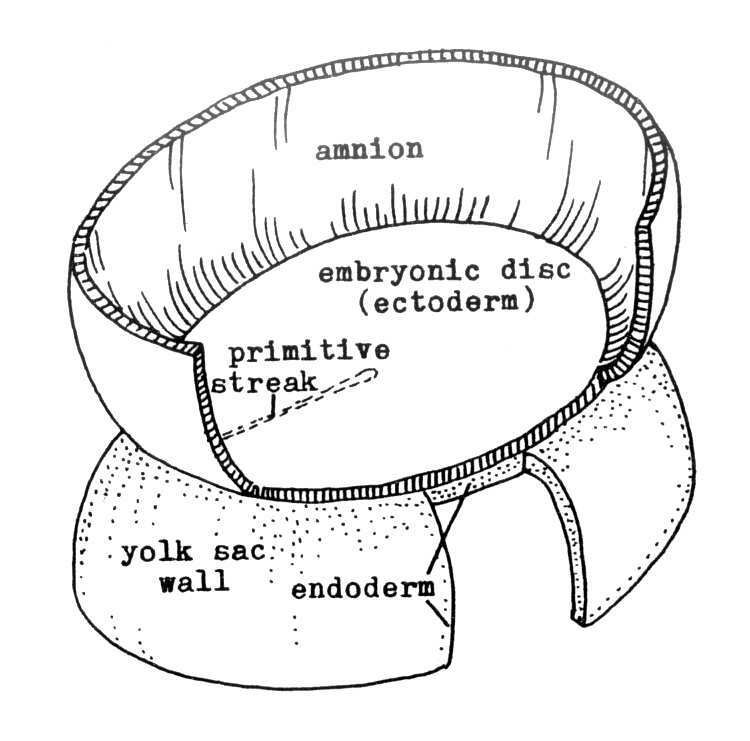 Human embryos at (i) 19 days, (ii) 22 days, and (iii) 25 days, in (a) median section, and (b) transverse section at plane indicated by dashed lines in (a). 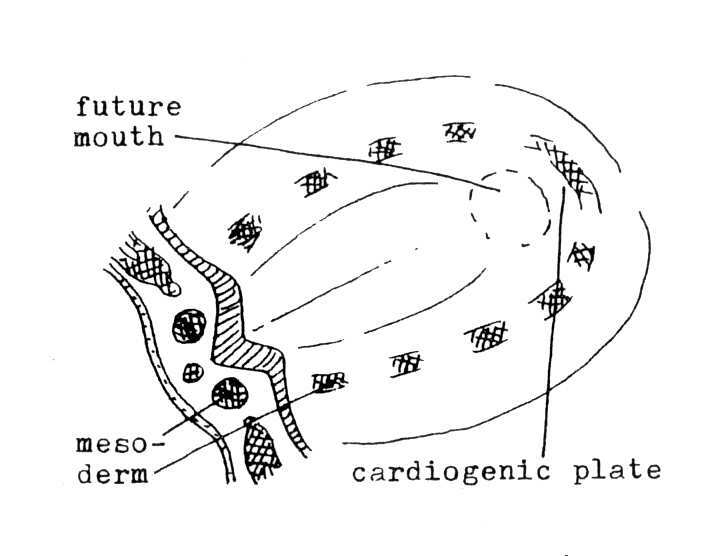 In (a), note reversal of the heart; in (a) and (b), formation of the digestive tube (gut) as it pinches off from the yolk sac. 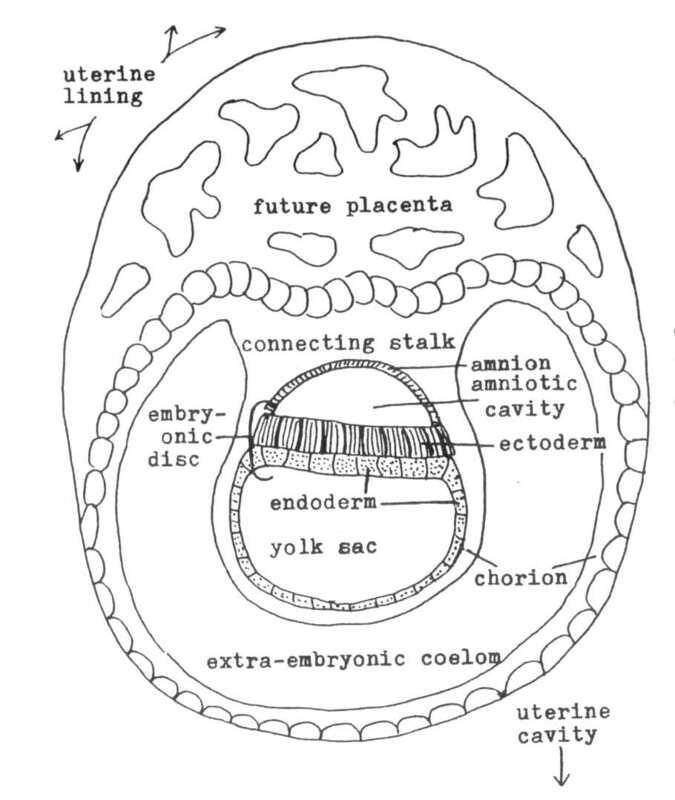 In M the neural tube closes and separates from the surface ectoderm. Neural tube becomes brain and spinal cord; neural crest turns into peripheral nervous system. (Modified from Hamilton, op. cit., figs. 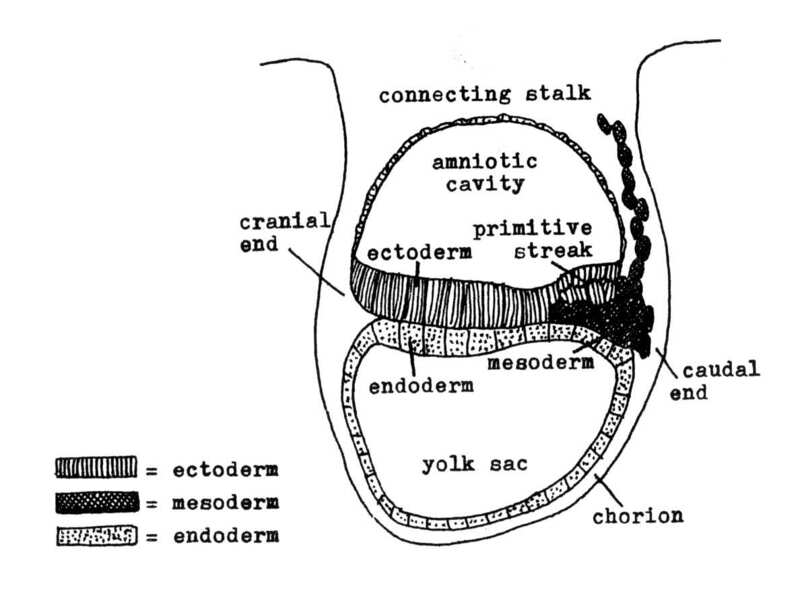 56-58, and Allan, Frank D., Essentials of Human Embryology, figs. 22-23.
create the eyes, which carry the world of the senses to the brain, Like the innervation of the skin, they form part of the lowest link in man in the pathway of ascent from the lowest to the highest. The encloderm gives rise to the digestive tract as well as the lungs and resphatory system (Figs. 4b-c). The use of the digestive tract resembles that of the lungs in that both structures take in substances vital in maintaining the life of the body, and both throw off wastes. Food corresponds to the knowledges of good and truth, and eating represents appropriation and instruction (AC 3513, 9412). Knowledges are the basis for the perception and affection of truth, and the functions of the lungs and digestive system are equally necessary to one another. As food and nourishment correspond to spiritual food and nourishment, therefore taste corresponds to the perception and affection of this food. Spiritual food is knowledge, intelligence, and wisdom, for from these, spirits and angels live and are nourished, and they desire and have appetite for them, just as men who are hungry desire and have appetite for food. Hence appetite corresponds to this desire (AC 4792). The celestial angels, in general, correspond to the heart and pulse of the Grand Man, and also to the flesh, even to the tendons, sinews, and bones therein; but the spiritual to the lungs and respiration, also to the various fibers and to the blood, and to the animal spirits. Indeed, the heart itself is a special kind of muscle. We can see a complete "triple series" representing love, wisdom, and use, in the different kinds of muscle: the heart is the inmost or love muscle, the visceral muscles are the mediate or wisdom muscles, and the most external are the skeletal or use muscles. The heart and lungs are the most obvious example, though not the only one, of mesodermal and endodermal derivatives acting together as love and wisdom. The digestive system displays a similar relationship on a more external level. While the digestive tube itself comes from the endoderm, which gives rise to thethe tube lungs, the involuntary visceral muscles which contract in peristaltic motion originate in the mesoderm, also the source of the heart. In each case, the part which absorbs the essential substance, whether oxygen or food, comes from the endoderm, which pertains to wisdom; and the part which propels the substance through the body comes from the mesoderm, which pertains to love. As the Writings say in AC 38872, "...There is everywhere in the body as it were an influx of the heart into the lungs; but according to the forms there, and according to the states." To summarize: the three germ layers of the embryo appear to correspond to the three degrees of the human mind. Love, or the celestial degree, appears in the mesoderm, which develops into the heart, circulatory system, muscles, bones, and connective tissue. Wisdom, or the spiritual degree, is represented by the encloderm, which differentiates into the lungs, respiratory and digestive tracts. And use, or the natural degree, takes form in the ectoderm, from which the brain, spinal cord, nerves, and skin arise. While man is an embryo, or while he is yet in the womb, he is in the kingdom of the heart; but when he has come forth from the womb, he comes into the kingdom of the lungs; and if through the truths of faith he suffers himself to be brought into the good of love he then returns from the lungs to the kingdom of the heart in the Grand Man; for he thus comes a second time into the womb and is born again. Then also these two kingdoms are conjoined in him, but in an inverted order; for previously the kingdom of the heart in him was under the rule of the lungs, that is, the truth of faith previously ruled in him, but afterwards the good of charity rules. 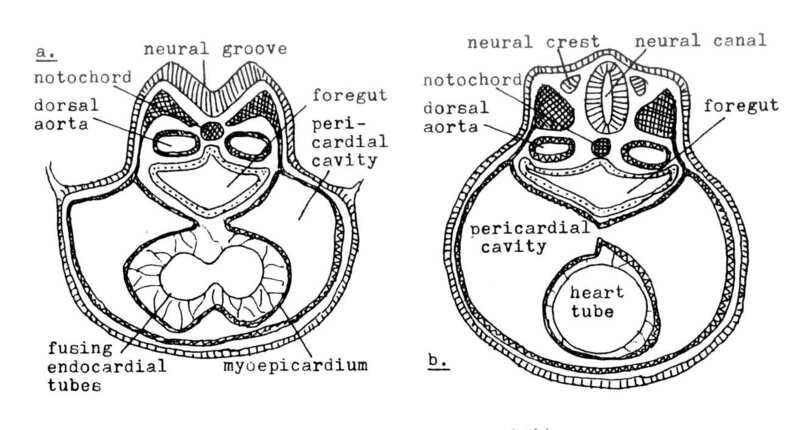 While the migration of the heart from the top of the embryo to its final spot below the head represents man's passage at birth from the kingdom of the heart to the kingdom of the lungs, the second inversion, the rotation of the heart within the pericardial cavity, represents his regeneration, when he comes again into the kigndom of the heart. ... Well differentiated vascular elements are found in early embryos and are intimately associated with the very early primordium of each organ. Furthermore, since the circulatory system must service every part of the embryo at all times, it undergoes rapid alterations of pattern in adjustment to the changing forms of the growing and differentiating complex of organ systems which is the embryo (Hamilton et al., Human Embryology, p. 159). `	The special relationship between the heart and the lungs also appears in prenatal development. 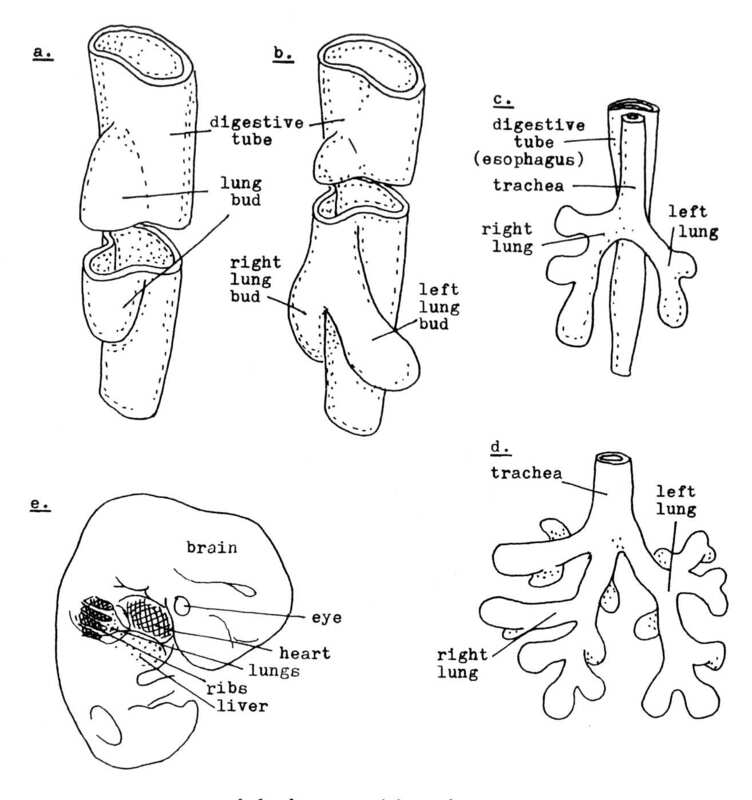 DLW 402 states: "It is evident from the heart and lungs, that the heart first forms the lungs, and afterwards joins itself to them; it forms the lungs in the fetus, and joins itself to them after birth." Not only does the heart send blood vessels to the lungs and form them as it forms all the other organs, but the developing heart itself acts as a mold or template which determines the shape of the lungs as they form around it (Fig. 6). To the angels of the inmost heaven correspond those tings in man which belong to the province of the heart and to that of the cerebellum, but to the angels of the middle heaven correspond those things in man which belong to the province of the lungs, and to that of the cerebrum.... 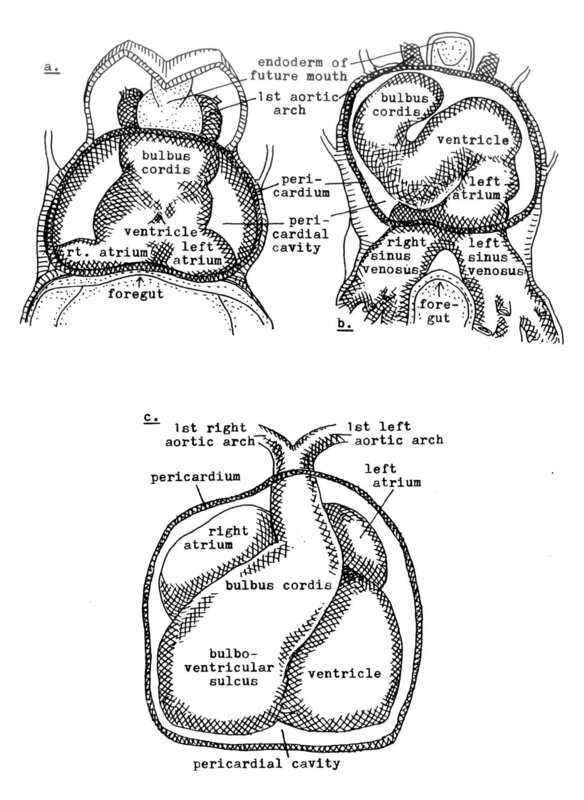 But to the intermediate angels which accede o both heavens, and conjoin them, correspond the cardiac and pulmonary networks of blood vessels by means of which is effected the conjunction of the heart with the lungs; and also the medulla oblongata in which the fiber of the cerebellum is conjoined with the fiber of the cerebrum. The early morphogenesis of the circulatory and nervous systems shows a similar parallel. 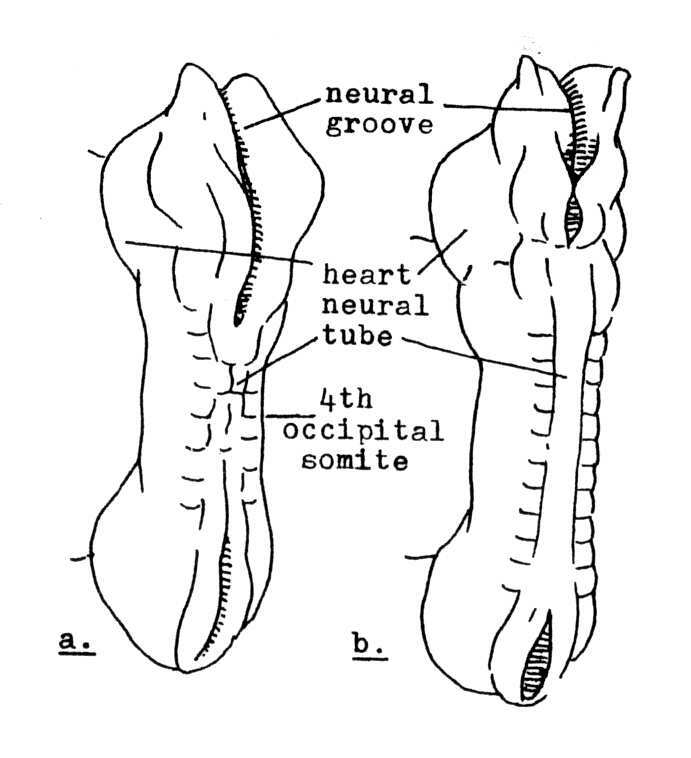 The central nervous system begins as two vertical ridges on the back of the embryo, separated by the neural groove; these ridges join to form the neural tube, closing like a zipper from the middle up and from the middle down (Fig. 7). The heart originates as a pair of tubes whose fusion also progresses toward the top and bottom, forming a single tube with four outlets, two arterial above and two venous below. As soon as the single tube is established, at the beginning of the fourth week, it begins to beat (Fig. 8). Since all things of the mind have relation to the will and understanding, and all things of the body to the heart and lungs, so there are in the head two brains, each distinct from the other as is the case with the will and the understanding.... In the other parts of the body, that is, the members, organs and viscera, the will and the understanding are joined together, and thus also there are pairs...and the viscera, which are not in pairs, are divided into right and left. Moreover, the brain itself is divided into two hemispheres, the heart into two ventricles, and the lungs into two lobes. Furthermore, many single organs were once pairs, and many that are paired were originally one. ... The brain itself is divided into two hemispheres, the heart into two ventricles, and the lungs into two lobes. The right of these relates to the goodness belonging to truth, and the left to the truth belonging to goodness.... And because the union of good and truth is reciprocal, and because of that union they become one, the effect in man is that these pairs act together and jointly in their functions, movements, and sensations. Just as the uses of countless individuals form the Grand Man of Heaven, every smallest aspect of human development contains the marriage of good and truth, which makes the Human Form. Acton, Alfred. "Human Development." The New Philosophy, Jan. -March 1976, pp. 339-375. 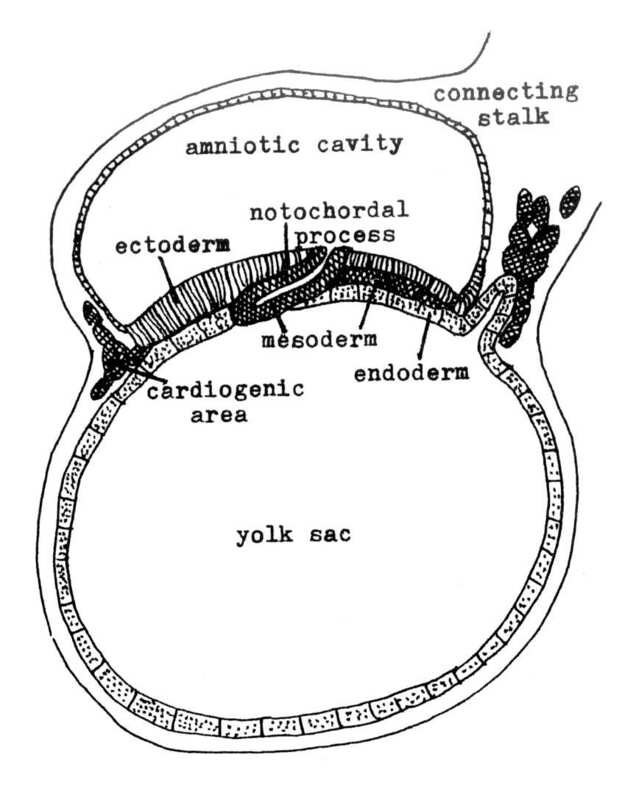 Alan, Frank D. Essentials of Human Embryology. Oxford University Press, 1969. Blechschmidt, E. The Stages of Human Development Before Birth. London: W. B. Saunders Co., 1961. Encyclopedia Britannica, 1975, "Human Embryology", Vol. 6, pp. 741-753. Hamilton, W. J., Boyd, J. D., Mossman, H. W. Human Embryology. Baltimore: Williams and Wilkins, 1962. Moore, Keith L. The Developing Human. Philadelphia: W. B. Saunders Co., 1977. Odhner, Hugo Lj. The Human Organic. Bryn Athyn, Pa., 1964. Tuchmann-Duplessis, H., David, G., Hagel, P. Illustrated Human Embryology. Translated by L. S. Hurley. Paris: Masson Co., 1972. Dedication: to all my teachers. I gratefully acknowledge the support of Mr. Charles Cole, who encouraged me in all my endeavors leading to this paper, and in particular has made much valuable literature available to me. I also thank the Rev. Chris Bown for making a special trip to New York to discuss embryology with me.